Specially designed for 1st, 3rd, & 5th Recon Bn and 1st & 3rd Force Recon Marines and Corpsmen. After a short layover in Taipei, where we endure the Big Speech, we depart for Vietnam. Our flight delivers us to Tan Son Nhut Airfield (once the busiest airport in the world), where we proceed through immigration, retrieve our bags, and clear customs. As we exit the airfield, we view the old ARVN HQ front gate and point out the U.S. Army's 3rd Field Hospital. Ever deeper into Ho Chi Minh City (still called Saigon by most Vietnamese), we head to the War Remnants Museum. Be sure to see the exhibit Requiem, a series of photographs by slain or missing combat photographers. We then motor through the center of the city and arrive at our hotel. Tonight, we enjoy our Welcome Dinner, after which we get a good night's sleep. We journey south on Highway 1 to visit the town of My Tho in the Mekong Delta. At My Tho visit Vinh Trang pagoda and then take a boat trip on the Mekong River to visit Thoi Son Island (Coconut Island) and Tortoise islet with lunch in the Orchard Garden. Visit An Khanh in Ben Tre to enjoy cruising on a hand-rowed sampan along the natural canals. We visit local houses, and workshops along the way. We boat back to My Tho and return to Saigon. Early this morning, we are back at Tan Son Nhat Airfield for our 8:00 a.m. flight to Chu Lai Airbase. We locate the original camp in RVN for 1st Force Recon, 1st Recon Bn, and 3rd Recon Bn where we stop for a visit. We then head up the hill to Ky Ha Helicopter Base and Logistics Command areas. Back down the hill, we stop at Crescent Beach and we enjoy an early lunch at Linda's Restaurant. Leaving the base, we turn north on Highway 1 and head to Hoi An where we will spend the evening. Another early morning brings us to LZ Baldy for a photo stop and then we move west-southwest to Hill 51 (LZ Ross) in Que Son Village, followed by a stop at the Que Son Pass. Heading down into Antenna Valley, we stop at Bridge #3 for a short ceremony in remembrance of LtCol. Leftwich and Team Rush Act. Motoring a little distance farther, we stop at an elementary school to visit with the teachers and children. We continue to the Song Thu Bon where we walk across the Nong Son Bridge to the Coal Mines area and distance photos of Hill 452. We then re-cross the bridge and head south to Hiep Duc. Our last stop is a wood-carving and silk shop as we arrive back in Hoi An. Hoi An, a beautiful well-preserved ancient trading port, is now a UNESCO World Heritage Site. Its temples and architecture show the different cultural influences of its time and its lovely Japanese covered bridge is unique to this town. Luckily for Hoi An, its importance waned long before the War, and it was left essentially isolated and relatively untouched. Tonight, dinner is on our own. Today is free day. You can relax by the pool, or you may want to roam by yourselves the streets and shops of this ancient port city, formerly known as Faifo, where Dutch, Portuguese, Chinese, and Japanese traders once walked. The town ceased to be an important trade harbor when its inlet shoaled, and the port was moved north to Da Nang. Shopping is excellent here and is one of the best places for tailor-made clothing. There are literally hundreds of amazing little shops in this town. Lunch and dinner are on our own today. Be sure to sample some of the many local restaurants and night spots in this fascinating little city. Today we run parallel to the southern edge of Go Noi Island, arriving at Hill 119 where we gear up for a climb to the summit. From Hill 119, we get great views of Hill 425; Alligator and Spider lakes; the Arizona Territory; and Go Noi Island. We stop at My Son Village for lunch, after which we make a special visit to the My Son Holyland located deep in the foothills of the Que Son Mountains. My Son is the site of Trakieu, the ancient capital of the Cham Kingdom, and contains ruins dating back to the 5th Century. We then make a photo stop at An Hoa Combat Base. After making a quick stop at Liberty Bridge (south side) we move across the new Liberty Bridge, stopping at Hill 55, and then run east on Route 4 (Thunder Road) back to Highway 1. Next, we climb Marble Mountain. This area is famous for their stone-sculpture industries. These mountains are visually-striking monoliths that rise from the flat coastal plain and are home to Buddhist shrines and numerous caves. We climb to the top of the largest mountain and explore the VC hospital area located deep within. Next, we pass through the site of the Marble Mountain Air Facility (a U.S. helicopter base during the war), after which we make a photo stop at My Khe Beach on the South China Sea. My Khe was better known as "China Beach," which was used as an in-country 'R&R' by U.S. troops. Following the beach road, we wind our way up onto Monkey Mountain to a 67-meter tall Lady Buddha who watches over the sailors and fishermen in the Son Tra Sea. After breakfast, we make a quick stop at Hill 10 and continue south to An My (3), the village where Lt. Frank Reasoner (CO/A/3rd Recon BN) gave his last full measure on 12 July 1965. Next is Hill 37 and Dai Loc. Turning west, we come upon Hill 65, Hill 52, and Thuong Duc. Tonight, we enjoy a Han River dinner cruise. Today is free day. You may want to take a stroll on the Han River Promenade, relax at the pool, visit the Han Market, attend mass at the Catholic Cathedral, or just sit at a roadside caf�, sip a cool drink, and watch the world go by. Lunch is on your own but be sure to join the group for the Dinner Cruise. 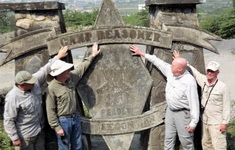 West of Da Nang Airfield, we seek the 1st Recon Camp Reasoner Gate and Guard Shack from the war days. Next, we attempt a climb to the summit of Hill 327 (Freedom Hill) from the west where we honor two-war Marine LtGen. B.E. Mick Trainor. We then ride up to the Recon Radio Relay site on Ba Na Mountain. We also visit the Hands Bridge while we are there. Our next stop is Hill 124 and, if possible, we climb to the summit of Hill 190. Upon our return we stop for photos at Nam O Bridge and Red Beach II, where U.S. Marines made their first amphibious landing in Vietnam in March 1965. Dinner is on our own tonight. Early this morning, we board a fast boat for our ride up the Song Cu De into Elephant Valley for a hike across the bridge to the old French road. We then venture up the breathtaking Hai Van, past the Esso Plant, and stopping at the Hai Van Pass (Pass of the High Clouds) to take in a parting view of Da Nang and her bay. The Hai Van Pass had been a vital strategic military foothold for the Chinese for centuries and was used by the French during France's Indochina War and by the U.S. in America's Vietnam War. Bunkers and fortifications dot the hillsides here. Continuing down the Hai Van to sea level, we walk the bridge separating Dam Lap An (Lap An Lagoon) from the sea. After lunch in Lang Co fishing village, we ascend to a lookout site on Bach Ma Mountain. Continuing north on Highway 1, we pass by Dam Cau Hai, one of the largest lagoons in Southeast Asia, encompassing 112 square kilometers, with its numerous fish farms. At Phu Bai Airfield we stop at an ARVN bunker for photos. Soon we enter Hue City (the old Imperial Capital of Vietnam) and arrive at our hotel in the center of the Southern City. This morning we begin our study of the 1968 Tet Offensive battle for Hue. The Battle of Hue was one of the longest and bloodiest battles of the war, and we spend our time visiting strategic sites in the fighting. We start in the southern city. We follow the actions of 1/1 and 2/5 covering, among others, the Shell Gas Station, Football Stadium, the former MACV Compound, Tran Cao Van Street, Joan of Arc Girl's High School, Hue University, Treasury, Public Health Building, Provincial Capital Building area, and the Church of the Redemptress. Famous for its university, this town, known for open and radical thinking, is also home to Quoc Hoc High School that graduated Ho Chi Minh, General Giap, and President Diem. We then enjoy a relaxing Dragon Boat cruise up the beautiful Perfume River to the Thien Mu Pagoda. It was from this pagoda that in 1963 Monk Thich Quang Duc was driven to Saigon where he immolated himself in protest to the SVN government's oppressive treatment of the Buddhist people. After lunch, we concentrate on the 1968 Tet Offensive battle for the Northern City. The Perfume River divides the Northern City ("old city") from the Southern City ("new city"). We enter the Citadel with its ramparts and towers, and visit a few sites specific to the battle, including the Chuck Meadows and Dong Ba Gates and Phase Line Green. We finish at the Imperial Palace gate blown by L/3/5, which allowed the ARVN to enter and lower the NVA flag that had flown from the main flagpole for 24 days. We then visit the Forbidden City, home to the ancient emperors. Early this morning we visit the DMZ and points west on Highway 547 past FSB Bastogne and FSB Birmingham to A Loui and the A Shau Valley. We pass Hamburger Hill and head north for the Da Krong Valley. We will stop at a Montagnard village as we turn west to Khe Sanh Combat Base. Under JFK, Khe Sanh Combat Base was a U.S. jungle outpost close to the border with Laos. The area grew into a major military base and airstrip under LBJ and was the scene of a 77-day siege in 1968, as well as many vicious hill battles in 1967-68. We have lunch in Khe Sanh Village. We venture west to Lang Vei Special Forces Camp and the Laotian border town of Lao Bao. We view the Co Roc Mountains to the west. We return east on Route 9 and pass Vandergrift Combat Base (LZ Stud), Ca Lu and take a photo stop overlooking the Rockpile. We make a quick stop at Camp Carroll, (the joint-forces artillery plateau). Heading east to Dong Ha, we stop for photos at the Dong Ha Bridge (destroyed by Capt. John Ripley which stopped the initial NVA advance during the 1972 Easter Offensive). We drive south on Highway 1 to Hue. Today is a day for roaming the streets and shops in Hue, walking the fascinating sculpture park along the Perfume River, or for a relaxing day at the spa. Lunch is on your own. Tonight Group 1 returns from the DMZ. After a leisurely breakfast, we head to Phu Bai Airfield for our 2:00 p.m. flight back to Saigon. As we are in transit, lunch is on our own today. Upon landing back at Tan Son Nhat, we transfer to our hotel. Today, we explore Reunification Hall (the old Presidential Palace). We also visit Notre Dame Cathedral and the Old Post Office (a great place to purchase last-minute gifts). We finish our morning with a pass by of the US Embassy compound (now the US Consulate) to see the place where Viet Cong sappers blew a hole in the compound wall and gained access to the Embassy grounds during the 1968 Tet Offensive. Then visit Cholon, which is considered the largest Chinatown in the world by area. While here we visit Cha Tam Church (Saint Francis Xavier Church) where SVN President Diem had fled and disguised himself as a priest during the 1963 coup. It was from this place that Diem and his brother were captured, taken away, and assassinated. Our afternoon is free, and lunch is on our own, but tonight all hands are required at our very special Farewell Dinner. After breakfast, we enjoy a little down time and then, if folks want, we will stop at the Ben Thanh Market on our way to Tan San Nhat Airfield for our flight to Taipei. Departing from Taipei, we gain a day enroute by re-crossing the International Dateline, arriving in the continental United States this same day.